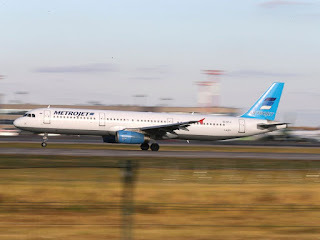 Cairo/Moscow, Oct 31 (IANS): A Russian airliner crashed on Saturday in central Sinai with more than 200 people on board, the office of Egypt's Prime Minister has confirmed. The office of Egyptian Prime Minister Sharif Ismail confirmed in a statement that a "Russian civilian plane... crashed in the central Sinai." The Russian aviation authority Rosaviatsiya said in a statement that flight 7K 9268 left Sharm el-Sheikh at 6.51 am and was due into St. Petersburg's Pulkovo airport at 12.10 am, BBC reported. Egyptian media reports said wreckage of the plane had already been found and at least 20 ambulances sent to the scene. Most of the passengers are said to be Russian tourists. Latest reports said it was carrying 217 passengers and seven crew. A Russian aircraft bound for St. Petersburg crashed in a mountainous region of Egypt on Saturday, killing all 224 on board. Kogalymavia Flight 7K9268 disappeared from radar 23 minutes after taking off at 5:51 a.m. local time from Sharm El-Sheikh International Airport in El Salam, Egypt, before crashing near al-Hassana, a mountainous area in the Sinai Peninsula, said Egypt's Civil Aviation Authority. An Egyptian official had previously told local media that the plane briefly lost contact but was safely in Turkish airspace. The Russian embassy in Cairo said the 217 passengers and seven crew members were killed. Egyptian authorities said the passengers were 214 Russian and three Ukrainians citizens. According to state news agency MENA, Sinai State Prosecutor Emad Eddin Mansour said authorities located the plane’s black box among the debris. Russian President Vladimir Putin is sending Russian emergency officials to the crash site. Relatives of the passengers gathered at Pulkovo Airport in St. Petersburg as the Kremlin declared Sunday as a day of mourning for the victims. Egyptian President Abdel Fattah el-Sisi is also returning to Egypt following a visit to Bahrain. He expressed his condolences to Russia in a statement. While on a visit to Kyrgyzstan, U.S. Secretary of State John Kerry expressed his condolences to the families of the victims. “We don't know any details about it but obviously the initial reports represent tremendous tragedy, loss, and we extend our condolences to the families and all those concerned," he said.